LUSH is taking over the grounds of an entire newly opened retail complex in Thong Lo with unique stylish restaurants, wine bars and green outdoor areas. – 4 indoor and outdoor dance floors in a set of beautiful and trendy venues with transparent spaces and patios. – 12 international DJs from some of the major clubs in Thailand playing on different outdoor and indoor dance floors, including hip hop, house, disco and a special Japanese flavored stage. – Oversized decoration, visual modern art exhibition and live painting performances on large canvases. 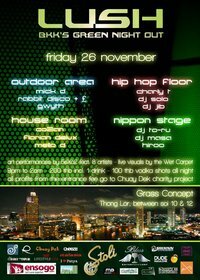 – Reasonably priced drinks during the whole duration of the event, including 100 THB shots. – 200 THB entrance, including 1 mixed drink. – All profits made by LUSH from the entry tickets will go straight to the Chuay Dek charity project financing an organic rice field near the Buddha Kasettra School in Mae Hong Son. This will provide healthy food for one year to 100 poor schoolchildren. This LUSH event is powered by Bless Entertainment and Ensogo.com, with the participation of Grass, Serenade Restaurant & Wine Bar, Rakuza Restaurant, Bangkok Nightclub Network, VIP Party in Bangkok, Dude Magazine and 5eXo2.